In addition to being a master hunter and tireless crusader for archery archery, sport of shooting with bow and arrow, an important military and hunting skill before the introduction of gunpowder. England's Charles II fostered archery as sport, establishing in 1673 the world's oldest continuous archery tournament, the Ancient Scorton , Ben Pearson was an accomplished industrialist and inventor. Ben was born in the hill country west of Little Rock, Arkansas. He received little formal education. Despite this, he soon showed skill for intricate work with his hands. This skill would serve him well, and benefit others worldwide in later years. A deep-thinking visionary, Ben became interested in archery in 1925, after reading an article in a Boy Scout magazine describing how to make bows and tackle. 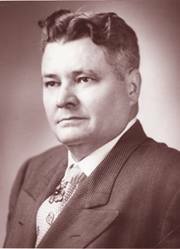 Ben moved to Pine Bluff, in 1927, and was soon building bows and crafting arrows part-time in a backyard workshop. 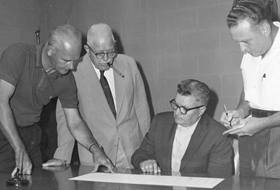 In 1931, with vision and belief, he hired several part-time helpers. In spite of the fact that the country was still in the Great Depression of 1929, sales continued to increase. ..... Click the link for more information.. Soon, Ben's inventive genius blossomed. He designed and built much of the machinery enabling the first mass production of bows, arrows and related tackle. (Due to this new revolution in manufacturing, the price of a quality Archery product fell into the reach of all with an interest in Archery.) By 1943, Ben Pearson Co. employed 365. 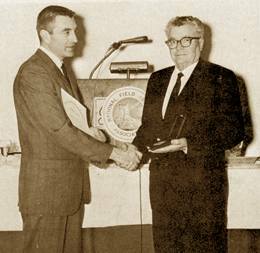 This number grew to 800 to 1,000 by the mid-1960s, with plant facilities covering over 15 acres in Pine Bluff and manufacturing facilities in Canada. Many believe he was the father of modern archery. It's even been said, "What Henry Ford did for mass producing the automobile, Ben Pearson did for mass producing of archery equipment." 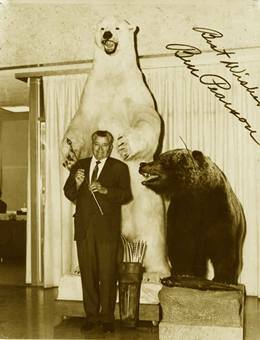 There can be no dispute that Ben Pearson commanded the largest facility, production and numbers of employees and representatives than did any other Archery manufacturer for the better part of three decades. 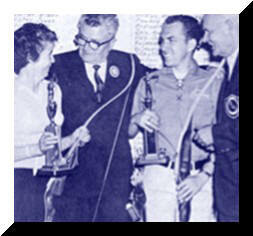 His promotion of Archery through sponsorship programs, tournaments, instructive Archery films, bow hunting films, personal Archery demonstrations, sponsored demonstrations of representatives, grand international bow hunts, cooperative sponsorship efforts with the Professional Archers Association, Archery Manufacturers Organization, National Field Archers Association, and efforts with Archery clubs and associations might also have been a consideration when he was awarded the Compton Medal of Honor and subsequently inducted in 1972 (the year of inception) into The Archery Hall of Fame in Grayling, Michigan.